You may be asked to decode data in a coding job. Numerous tools can be used to analyze data. In addition to Python, you may have heard of R, SAS, Stata, and SPSS. SPSS does not have all the capabilities of the other tools, but beginners can use it to perform straightforward statistical tasks easily. SAS and Stata, which are programming languages, are powerful for some types of tasks but can be limited for more advanced data analysis. Generally, R and Python are considered the most powerful languages to use for modern data analysis. Both languages have strong statistical capabilities, increased functionality through external packages and libraries, and a growing community of users that provide support. Free and open source: Download R and use it at no charge. It’s hard to beat free, especially when SAS, Stata, and SPSS charge for either the software package or annual licenses to use the software. (The fee often includes technical support.) R also allows you to freely modify the software. Interoperable: Interface R with other statistical packages such as SAS, Stata, and SPSS. Multiplatform: Use R on a variety of operating systems, including Windows, Mac, and Unix operating systems. Visualizations: R comes with built-in visualization capabilities that make it easy to create colorful, professional looking charts and graphs. Expanded functionality: Download freely available packages that add functionality and features such as text cleanup, visualization, and geolocation mapping. R uses a command-line interface; you type your code one line at a time. You can also store the code in a script file and reference it when necessary. R is made friendlier by a number of code editors and graphical user interfaces, including RStudio, and R Commander. 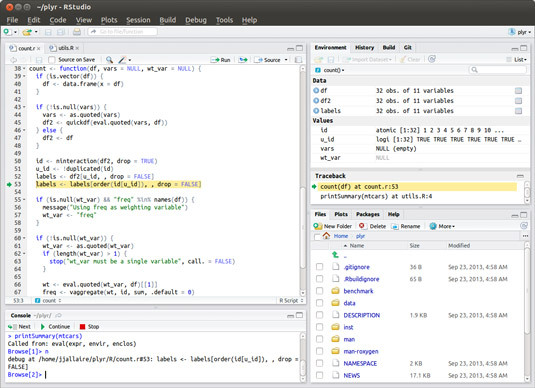 RStudio is a code editor to make programming in R easier. Free and open source: Download and use Python for free, and freely modify the program. Interoperable: Use plug-ins to integrate Python with other statistical packages, such as SAS, Stata, and SPSS. Note, however, that these integrations are experimental in many cases. Multiplatform: Run Python on a variety of operating systems such as Windows, Macintosh, and Unix. Visualizations: Python includes support for charts and graphs, but it is not as developed as R. However, this functionality is improving through the use of external APIs. If you’re wondering whether to learn R or Python first, think of your goal and what project you want to complete. Then do some research to find the language preferred by your employer or coworkers and the language in which other similar projects were coded. Also check the online forums for discussions relevant to your topic area or goal. You can see an example of Python and R used to solve the same problem, with all the steps from setup to conclusion. In the blog post at the Swarm Lab, the authors created a graph of the top 25 most violent films, ordered by number of screen deaths per minute, using Python and R.